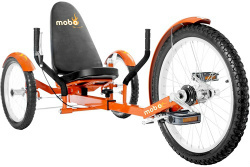 The Mobo Triton chainless tricycle is a three wheeled recumbent that is extremely maneuverable and is great for active adults. The design is beautifully simple with a really unique steering mechanism and no chain. So, maintenance could not be any easier. The comfortable recumbent seating position means no pressure on the wrists, elbows and hands. 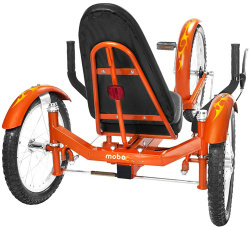 A front freewheel mechanism, a generously padded seat and inflatable tires provide a smooth and comfortable ride. With the unique steering system you can just about turn on a dime. This tricycle is definitely not for everyone but if you are the kind of boomer that is physically fit, and likes to have fun, this bike may be perfect for you. This recumbent trike has 8 adjustments to accommodate riders up to 6'3" tall and maximum weight capacity of 250 lbs. .